Home Shore Environment Will Offshore Wind Turbines Be Visible From Ocean County Beaches? Will Offshore Wind Turbines Be Visible From Ocean County Beaches? This week, the federal government announced the award of two leases off the New Jersey coast where thousands of wind turbines could eventually be constructed – likely within view of the naked eye from beaches. But the view off Ocean County’s northern barrier island will likely remain unobstructed. The Bureau of Ocean Energy Management, an arm of the federal Department of Interior, announced the two 25-year lease awards earlier this week. Permission to develop turbines in the southern area, a swath of 160,480 acres off Cape May and southern Atlantic counties, was granted for $880,715. The lease went to RES America Developments Inc. The northern portion, 183,353 acres of ocean off northern Atlantic and southern Ocean counties, was leased for $1,006,240 to US Wind Inc. While offshore wind turbines have received praise for generating renewable electricity, it has faced opposition, primarily from coastal residents and governmental agencies, over the potential for the facilities to disturb an otherwise unobstructed view of the ocean. In the Long Beach Island portion of the New Jersey lease area awarded this week, turbines visible from the beachfront is a distinct possibility. 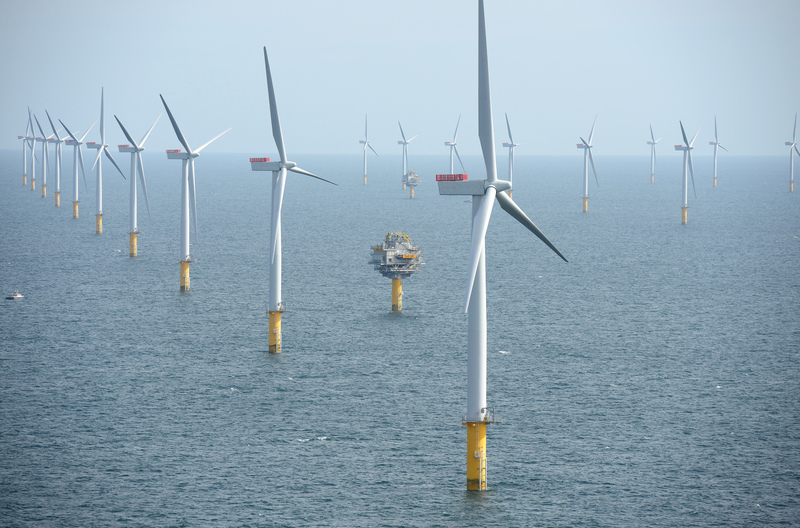 The turbines, according to BOEM, will be located seven nautical miles offshore – well within sight range, according to a study of similar facilities in the United Kingdom. According to the Argonne National Laboratory, the study showed that offshore turbines were visible at distances of 26 miles during the daytime and 24 miles at night, and may be a “major focus of visual attention” at distances of up to 10 miles. 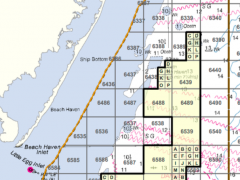 The northern portion of the leases awarded this week are at their closest point – about 7 nautical miles – to shore off Ocean County, where the development zone runs along the entire southern half of the island, from Holgate to Surf City. The same distance between the shore and development south of Ocean County – from Brigantine south to Sea Isle City – exists to barrier islands in that area. The northernmost boundary of the leases awarded this week is in an area east of Surf City and the North Beach section of Long Beach Township, leaving the northern barrier island squarely in the clear. 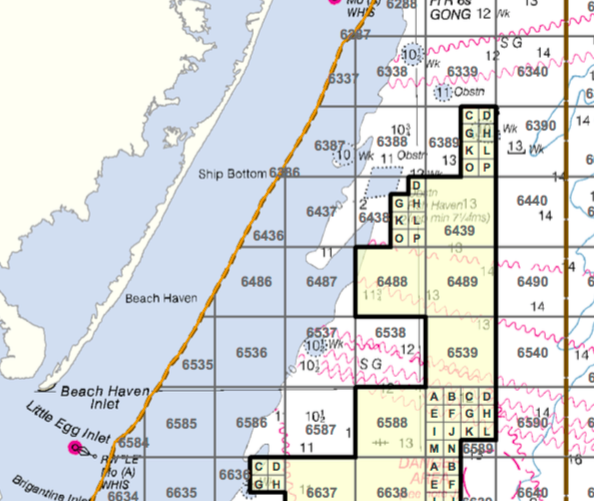 The third offshore wind development zone, according to maps released by BOEM, will be located 11 miles south of the Long Beach, N.Y., but far removed from the view of the northern Ocean County and southern Monmouth County coastline. That project may prove more controversial than the lease areas awarded this week, primarily due to opposition from commercial fishermen, who worry that the wind development may destroy scallop beds. Physical construction on offshore turbines off New Jersey may still be years away. Environmentalists who support offshore wind development have been frequent critics of the administration of Gov. Chris Christie, whose administration has not published rules for offshore wind financing through the state Board of Public Utilities. The two winning bidders under the federal lease auction now have four years to design construction plans, at which point an environmental review process will begin, which will include public comment. As for the southern Long Island project, bids have not even been formally sought, though BOEM is currently gauging industry interest. The ocean off New Jersey is a good location for such development, according to one prominent New Jersey environmentalist.